I love my state and I love my city. It's beautiful. Every year people come from all over to vacation here and I consider myself lucky to be able to call it home. There are so many things to see and do here. Sometimes I forget that when I'm hoarding time off from work to use for getting myself out of town. We had family here, so I released my death grip on two vacation days and we had ourselves a staycation. 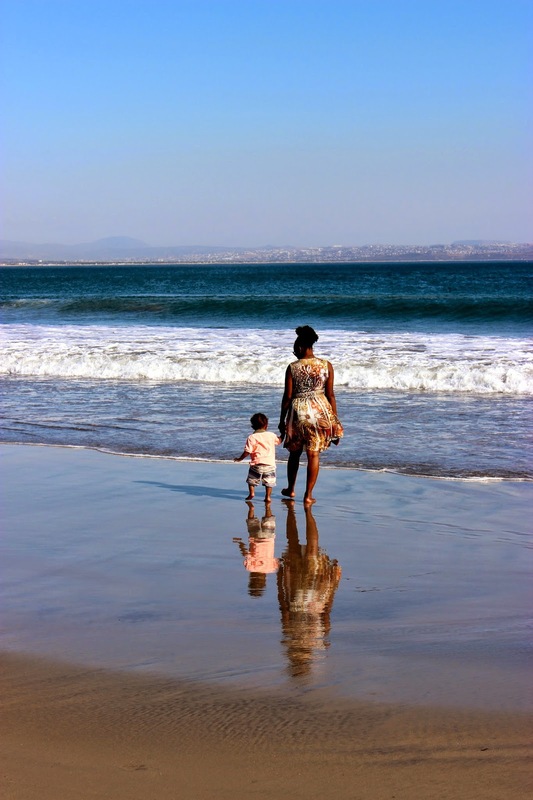 Our first outing was the San Diego Zoo and then we spent two nights on Coronado Island. MJ caught this amazing pic on night #1. The moon was brighter then I've ever seen it. We could not have asked for better beach weather. It warmed up every single day until it got into the 100's by the coast just in time for our beach day. I like my beach days hot because no matter how warm it gets Southern California water stays cold. I usually barely dip my feet in but since it was so hot I wanted to do more then that. The first 5 minutes or so is kind of painful as your feet gets used to the ice cold water. The first time it hits your girly parts is a shock too but after that it feels really good to be out there. I had a lot of fun splashing in the waves until my feet went numb. It started to feel like I was walking on stumps so I had to get out for a while and then went back in. MJ, his mom and cousin Rai had a lot of fun body boarding. This is totally out of the question for me since I can't swim but they had a good old time disappearing under the waves. You can't spend all day at the beach without some sort of shade. At least I can't. Baking in the sun like a rotisserie chicken for hours on end is not my style. Shade AND sun screen is a must. We were able to stay out there way longer then we would have without it. We spent most of the day at the beach then transitioned to the pool for a few hours which is really the best way to do it. Sand is a beast. It gets EVERYWHERE and there is no escaping it!! After dealing with sand all day the pool feels so fresh and clean. We rinsed off and enjoyed more water fun before heading back to the beach house. This water feature was so much fun. You can't see it in the picture but there are about 6 buckets at the top that swing back and forth as they fill up with water that squirts into each one. Once they fill up they randomly tip over dumping a bucket load of water on your head. I have a hard time easing myself into pool water. It's always too cold for me so I forced myself to get dumped on there and then getting in was really easy. I loved it at least as much as the kids did. The little one couldn't get enough of splashing in the mini fountains that circled the edge. On Saturday we went to LA. The main purpose was to go to Roscoe's Chicken and Waffles but since we couldn't spend almost two hours driving there only to eat and turn around we stopped at the Santa Monica Pier first. We walked around and MJ's nephew rode a few of the rides. We had to lead him out of there crying because four rides is never enough. Something tells me that 10 rides would not have been enough either. 1. Coronado Beach is my favorite beach. The part we go to is only accessible via Naval Air Station North Island so there is very little traffic and way less people then you find at public access beaches. 2. The Beach Cottage was so cute with 2 bedrooms, 1 bathroom and a full kitchen. There is the hotel and there are beach cottages. You have to reserve a cottage at least 6 months in advance in order to get one because there aren't that many. They are staggered so that everyone has a beach view. This was another one of MJ's great ideas and I think we should make it a yearly thing. 3. Can I just stay here forever and never go back to work? Pretty please. 4. We ordered pizza the first night and MJ grilled Carne Asada Tacos for dinner the 2nd night. Perfectly paired with a pale ale beer he brought back from Germany. Usually "his" beers are way too heavy for me but I liked this one. 5. We stopped at In & Out for breakfast on the way home from Coronado. When you are on vacation you can do things like that. I haven't had In & Out since I was a kid. It was on my not allowed to eat list (along with too many other things) for a long time. I've been missing out. 6. The iconic meal from Roscoe's Chicken & Waffles. This is not my plate. Trust me to go there and not order chicken and waffles but everyone else did. People love the combo but I'm not sure it's my thing. I ordered a chicken sandwich-which was one of the best I've ever had, with fries. I will say that the kids were a little bit much to handle for 10 days. Sunday morning I came downstairs and the 3 year old was buzzing. Literally buzzing. Like bzzzzz, bzzzzzz, bzzzzzzz and he would not stop. All I could think was make it stop!! There was an obnoxious sounding cartoon on TV and I'm a little Tea Cup on repeat coming from a toy tablet. It was an is this really my house twilight zone moment. The upside is that I HAD to get out of the house so I went to the gym for the first time since January and burned 650 calories. I can pretend that I would have gone anyways but I'm not so sure! They want to come back again without the kids and I'm totally okay with that. I'm an introvert. The prospect of having that much company all day every day was really overwhelming for me. I like my routines and I have a general fear of having them interrupted. I like to watch House Hunters while I eat breakfast. I enjoy silence and need alone time to recharge. Throw kids in the mix and I was more then a little freaked out. I like my house clean and tidy. Kids are anything but. Of course I worried for nothing. I mean, that's what I do; even when I know it's going to be okay. Once they got here I was glad to see them. It was a perfect excuse for a staycation which felt less like a staycation and more like a vacation. We had such a nice time that drool on the couch from a teething baby is really just water under the bridge. Having house guests is kind of like the So Cal ocean. Our water is cold but once I dip my toes in and go for it, I find that it's a lot more fun then I thought it would be when I was staring at it from a distance. This is a nice post. I too am an introvert. Anyhow coronado beach is lovely, we visited once for our anniversary and promised to go back again. and yes - our water is cold...i can say our since i've been here for 7 years and counting. we went to zuma beach on mothers day, it was windy but the water was cold. roscoes grows on you (maybe literally). the first time i had it i didnt see what all the fuss was about, but after the 2nd time i had a greater appreciation. California really is a beautiful place to live and I like the beach cottage idea. That first picture is SO amazing! What a great shot! It looks like you had such a great trip, but I totally feel you on needing your own time to recharge! Sometimes I stress myself out before visitors as well, but as you said it always turns out to be worry for no reason! I've never been to California but my husband has been quite a few times and anytime he has chicken and waffles he brings up Roscoes and how those are the best chicken and waffles ever! I have always wanted to visit San Diego. The pictures just make me want to plan a trip out there. Looks like such a great spot to vacay and it would be awesome to live so close. I wish I knew how to swim so I could fully enjoy the beach. Glad u had an eventful staycation!! I didn't think I was such a routine type of person until we moved to PA. I like my routines and I don't like things to change without much notice. I always thought I was a go with the flow type of person but I'm learning that I am so not. Maybe I once was but not anymore. I wanted to move to San Diego so badly when I first graduated from college and sadly it did not happen. It is so awesome that you live in a type of place that people from all over want to visit. It's so beautiful there. The pictures are fabulous and it looks like a great time! Glad you let go of those vacation days to enjoy a staycation! sounds like a fun staycation! my friend lives in LA, so when i visit we always stop by the beach and i put a toe in the water but it's too cold for me to go in. i always prefer pools too! I feel the exact same way with house guests. D and I have such a peaceful home, it feels out of control when there are others here with us for more than a night or two. The same is true when we go visit people though too. I need to leave their house for a long lunch or dinner to get away too. Love seeing our city through your pictures! Well you beat me to it. My husband and I are deciding to do a staycaytion this summer with the kids. Our island is typically a tourist destination so we're going to take some time off and do the things that the tourists normally do. We may probably do a day pass at one of the hotels and have a good time. Great photos. It looks like a lot of fun! I neeeeddd to spend some time in San Diego! It looks so awesome! I had Chicken and Waffles a few months ago, and I'm IN LOVE. I'll come play at your beach and eat chicken and waffles this summer! I am an introvert as well. I am trying to put myself out there a little more and enjoy being around other people. Looks like ya'll had a blast! I really enjoy reading your posts about San Diego. My husband and I are actually moving from cold Germany to San Diego (what a transition) and I love seeing San Diego through the eyes of a local and what kind of places you like. We actually have been there 2 weeks ago and lucky us, during the heatwave, so we went every day to coronado beach or del mar beach. It`s so beautiful and whats even more important Americans are so nice, relaxed and helpful. Quite the opposite from us grumpy Germans. So we are really looking forward to our move and please, keep on going with those lovely San Diego posts. I LOVE Staycations I feel the same way about where we live, there is always SO SO much to see, you never feel like you have enough time! Love all your pictures and suggestions! All of your posts make me want to visit California soooo badly!! I cannot wait until it is warm enough to go in beach water here in NY. Great post and you are rocking that bikini, girl! See, this is why I'm sticking to eating healthy now... lol. By the way, I like House Hunters, too and I'm glad you had fun on your staycation. Oh my gosh, I wish I was at the beach right now! Looks like you had a great time! I wish I could go to the beach! The pics are amazing and you looked like you had a ball. I know the feeling though. I think I told you I'm an introvert and it's hard for me to hold my composure (but I always do) when I'm around so many people and so many things going on at the same time I just want to run away to somewhere quiet even if its for 10 mins. I do like company and going out but I have a limit to how much I can take lol. This is so great, I have been wanting to plan a trip to CA and you gave some great suggestions. I have heard the water is cold there. I grew up on the Atlantic, which was chilly, but usually warmed up in the summer. I also hardly ever go in the water bc it's so cold! but once I'm in there I really like it. and I often say I'm an introvert in an extrovert's body. People don't think I'm shy, but I NEED alone time to recharge. I am definitely an introvert too, so I know what you mean! It does sound like you had a really nice staycation, though :) I love your tent set up! I don't like getting in the water, either. I used to, but then I got stung really bad by a jellyfish about five years ago, and that was pretty much the last time I got in past my knees. I also have a huge fear of sharks (which started around the same time), which I'm sure has also contributed. LOVE the analogy at the end. I think that would be so true for me for a lot of things. I think you and I are so much alike when it comes to being introverted and just cautious about things. I'm so glad you had fun with MJ and his family. CA is beautiful, it looks like the perfect staycation/vacation! Wow, absolutely beautiful photos. I'm so jealous of the warm weather. I have been to Roscoe's Chicken and Waffles! It wasn't my favorite place, I must admit. But it was definitely a fun experience and I saw Tyra Banks and she is gorgeous. I agree on the kids...sometimes I just want to wake up and relax. But that is just impossible....sigh. Enter to win a personal styling session! I loved everything about this post. Those cottages sound wonderful! Sometimes we get to camp near Coronado, and it is always soooo lovely and peaceful!